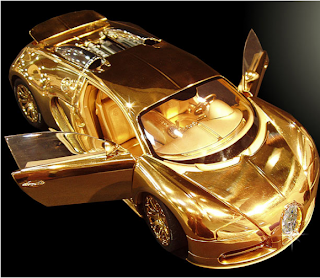 This is the world’s most expensive model car. The Bugatti Veyron Diamond Ltd is on sale for two million pounds – twice as much as the real thing. Liverpool-based designer Stuart Hughes took two months to create the intricate 1:18 scale model in partnership with Swiss luxury model car maker Robert Gulpen. Weighing in at 7kg, it has been created with platinum, solid 24ct gold, and a 7.2ct single cut flawless diamond on its front grill. The 10 inch car also boats functional steering and a highly detailed engine. In a limited edition of three, owners also get a certification of authenticity, an aluminium case and photo documentation of the manufacturing process.